An autonomous drone rocket from Elon Musk’s aerospace company SpaceX self-landed on a floating barge Friday, thus initiating the first step towards rocket reusability and launch turnaround time reduction. 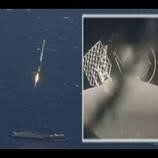 After four failed attempts, the rocket’s return became the first successful ocean landing by an unmanned drone, a little more than a year after another SpaceX drone self-landed for the first time on the ground. Ocean landings are far more difficult to execute than on the ground, but will be more cost and time efficient for SpaceX’s Falcon 9 program, which has been contracted by NASA for 20 missions. When rockets are launched, they follow a parabolic arc of flight, moving them horizontally far from their launch pad and into the ocean. To return to the launch site for a landing would require more fuel to combat the rocket’s natural trajectory. Instead, physicist’s can calculate the rocket’s flight path so that an awaiting barge can be an on-call landing pad, thereby saving the rocket all the troubles of backtracking in-flight. Ocean landings will be a necessity for some Falcon 9 missions required to launch spacecrafts deep into space by using more fuel to reach higher velocities, leaving little leftover for a safe rocket ground recovery. However, in order to accomplish true cost efficiency, SpaceX’s rocket reusability program will have to assess whether the rocket can be re-launched into space with minor refurbishments. The Falcon 9 rocket drone was a mainstage booster for the Dragon spacecraft that’s carrying a resupply load to the crews on the International Space Station. When docked at ISS, the Dragon spacecraft will demonstrate its newest addition an inflatable space habitat that extends from its trunk, much like extensions on RVs. When the spacecraft returns to Earth, it will return with trash, important data collections, and defective hardware in need of repairs.